To round out another golf-filled weekend here in Southern California, my last stop today was at The Links at Terranea in beautiful Rancho Palos Verdes, CA. 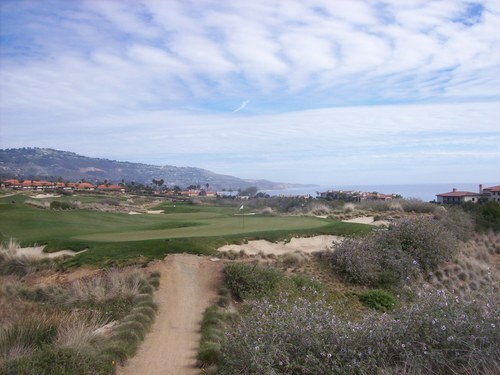 RPV gets plenty of attention from local golf-lovers. 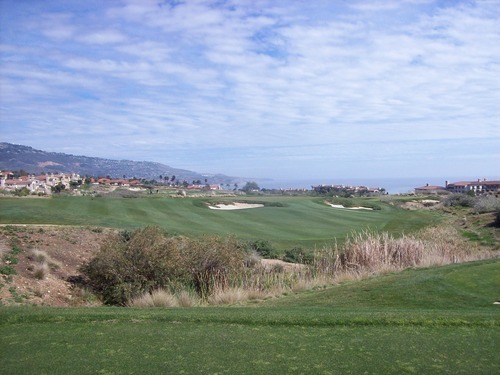 One of the area’s premier high-end courses is located here (Trump National Golf Club, formerly Ocean Trails) and so is one of the area’s most popular muni courses (Los Verdes Golf Club). But the one you don’t hear much about is Terranea. 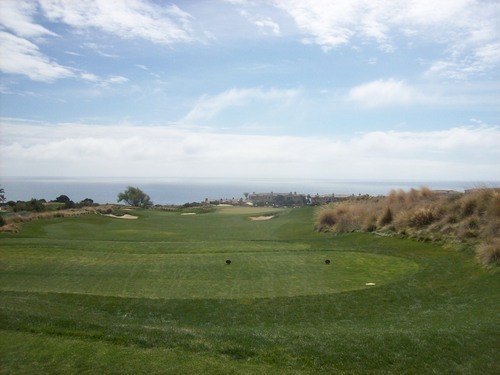 That’s partly because it’s a fairly new course (opened in 2009 as part of the posh Terranea Resort) and it’s also because it’s a 9-hole course with only par-3 holes. I know quite a few serious golfers who scoff at the idea of par-3 tracks or executive layouts. 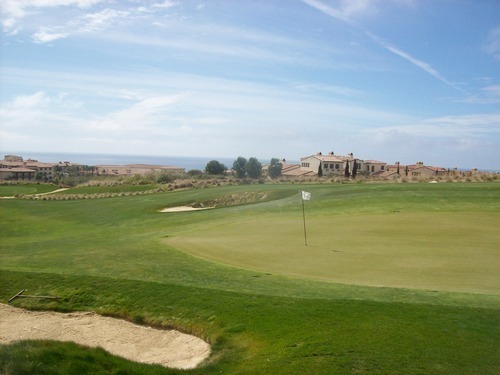 I feel sorry for them because they could be missing out on a real gem here at Terranea. 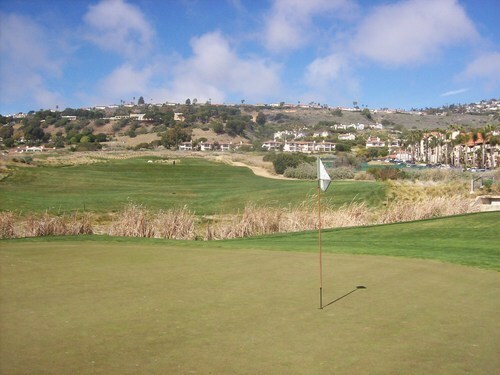 I’m known to discount non-regulation courses sometimes myself, but there’s a huge difference between a beat up little course like Kings Valley, the course I grew up playing, and something truly special like found at The Links at Terranea, Monarch Dunes’ Challenge Course in Nipomo and Shadow Hills (North) in Indio. I’ve been wanting to play this course since it first opened, so today was finally the day. One major deterrent of Terranea is the price. 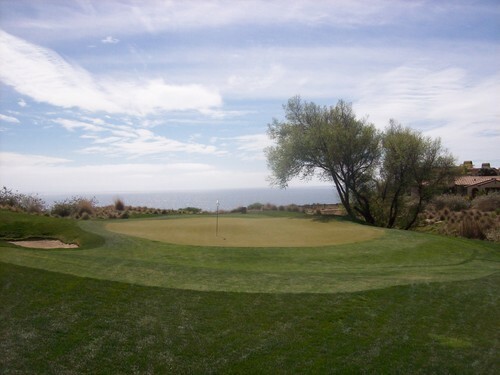 It’s part of a high-end resort and it’s in a place where real estate is extremely valuable, so the cost to play here will rightfully scare some people away. The general weekend rate for walking 9 holes is $48, which is way too steep. However, they do regularly have deals online at sites like EZLinks.com and GolfNow.com, so it’s well worth seeking out a deal like I did for my own round today. I reserved my 11:30 tee time on EZ Links. It was $21, but they also had a promo code that they sent out earlier in the week, so my total (with the $1.99 booking fee) was $17.74. Too good a deal to pass up! As soon as I pulled up to the resort, I could tell this was going to be a really neat little course. The views are magnificent and the facilities are first-class (actually the course pro shop is very tiny and scaled back, but the resort itself is very nice). 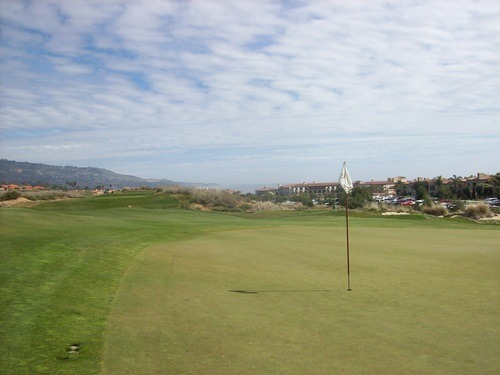 They have a great short game practice area here, including a large putting green and several small chipping greens. There is no driving range, but they do have an indoor net and simulation software for lessons. 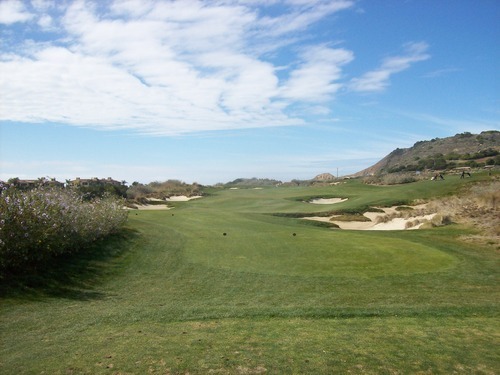 If Pacific Dunes in Bandon and Trump National had a little baby together, The Links at Terranea would be it. It’s a throwback seaside links style design by Todd Eckenrode with views/features that rival that of Trump down the street. 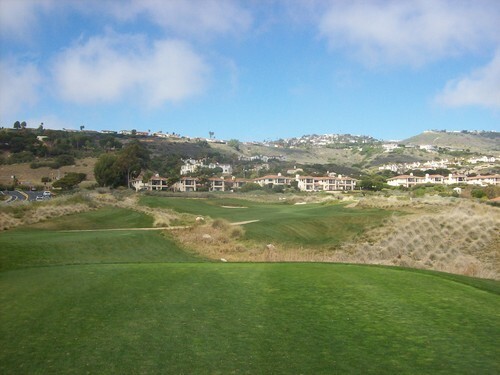 The holes range from around 100 yards to 175 yards, so you get to use a number of clubs. The greens are big and feature some severe undulation. The bunkers are carved out of the natural terrain for a rough-hewn links look and there are many collection areas of shaved down fairway grass between the tees and the greens, as well as around the greens that feed off as collection areas. On this course, it’s all about catching the right slopes. You can play high, soft shots or low runners, giving you lots of different options to consider. Overall, it’s a fairly forgiving layout, which makes sense as a “resort” course, but there is still enough bite in this baby to make you work for a good score. 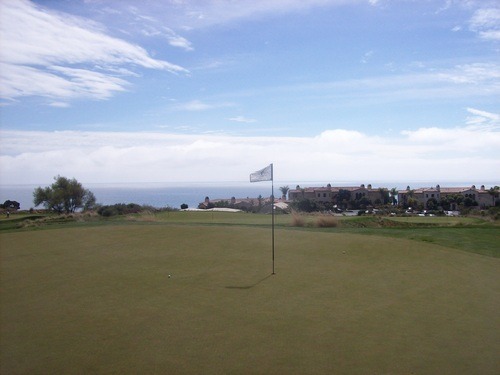 If you miss a green, you are likely looking at an awkward chip or a long putt from off the green. There are uphill holes, downhill holes and flatter holes, providing a good variety of hole designs. And of course, the views are spectacular. It’s just a beautiful setting for a golf course. It’s hard not to be in a good mood while walking around this place. For me, it was kind of a zen-like round and really what I needed to change my perspective on the game again. 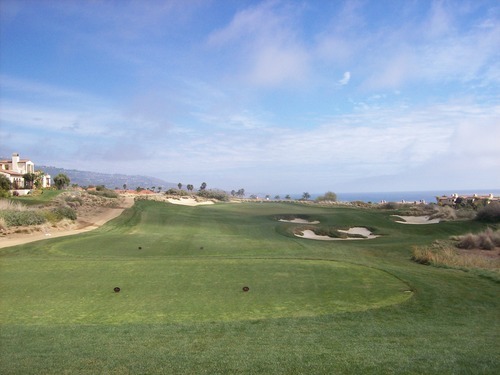 I’ve been really struggling with my play lately and Terranea made me remember why I love playing golf so much. It not only took me back to my childhood par-3 pitch and putt roots, but it’s also a truly wonderful course that made me feel happy all over. Another reason I chose to play here this weekend was the weather. It had been gorgeous and clear Friday and Saturday, and Sunday seemed to have a similar good forecast. Unfortunately, it was a little cloudy today, but still nice temperatures and clear enough to get the beautiful ocean views throughout the course. I got to the course early and they let me off by myself around 11:00. After the first couple holes, I got stuck behind a twosome and they had a very slow foursome in front of them. So, I didn’t press. Rather, I just relaxed, enjoyed the scenery and enjoyed a nice peaceful, slow round of golf by myself. Another single caught up and joined me for holes 7-9, which was enjoyable. The first nine took about 1:45, which is definitely too slow for this short course, but again I really didn’t mind taking my time out here. As the first nine holes were coming to an end, the weather started getting even nicer. They had already told me a replay round would be $18 more, so I knew I would go around again. This time, I was playing behind several twosomes and the pace was a little quicker for the second nine—closer to 1:15. When I paid for my replay, the guy in the pro shop mentioned that because I had a discounted rate earlier, they’d normally charge me a full $48 for a replay round. I wouldn’t have paid that, but fortunately they were feeling generous since it wasn’t too busy out there. I’m not really a fan of this policy, and it is definitely worth pointing out if you are thinking of playing 18 here. 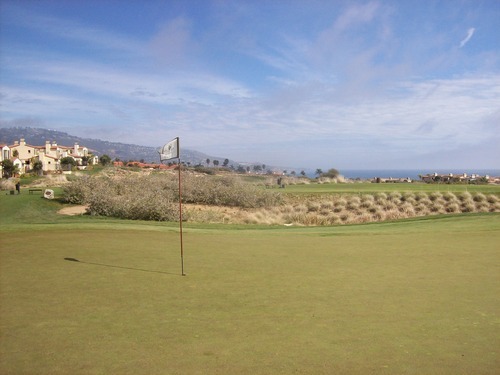 The conditions at Terranea were very nice. The grass on the fairways and tee boxes was green, lush and consistent. The greens were kind of firm and thin, but that’s exactly what you want in a links style course, so it’s a proper surface. There were a lot of unrepaired ball marks I fixed up. That’s one of the unfortunate aspects of this being a resort course that gets a majority of its play from casual guests who may not follow typical golf etiquette. Overall, though, I was impressed with the conditioning of the course. It presents well as a high-end course to help justify some of that price tag. 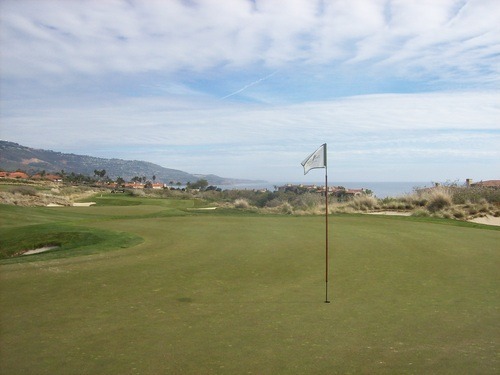 If there is such a thing as a “must-play” par-3 course, The Links at Terranea is it. 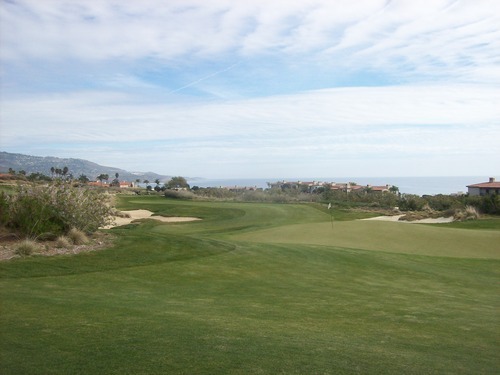 If you are one of those super-serious golfers, just turn off your normal golf mindset, tee it up at Terranea, relax and enjoy a fun round on a neat little course. 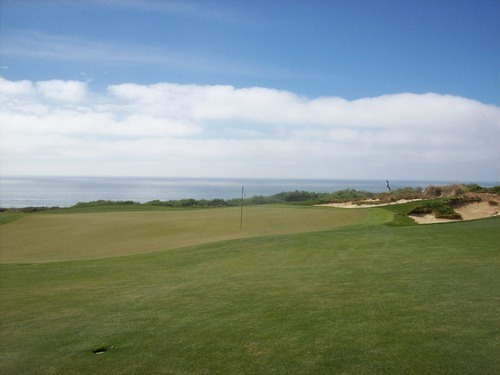 If you are a beginner or a casual golfer, check this course out and you will have a ton of fun while getting to enjoy stunning oceanfront views that would normally cost you an arm and a leg on a course like Trump. 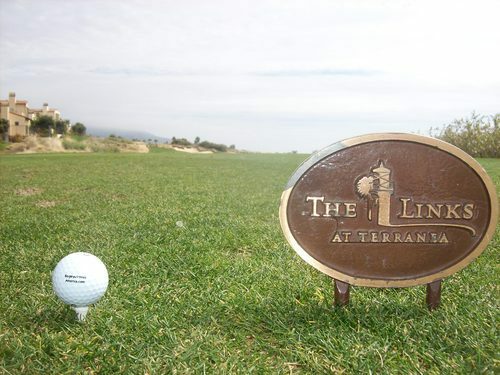 If you can’t tell, I really liked The Links at Terranea. I don’t love the normal rates here, but deals aren’t that hard to find and it’s worth checking out at least once if you live in SoCal like me. 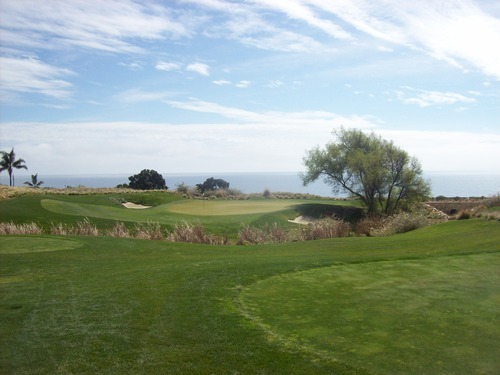 I wouldn’t fly across the country just to play this course, but if you are out visiting Trump National or Los Verdes, add Terranea to your trip as a great warm-up or cool-down round.